Decorating trees during what has become known as the Christmas season began in Germany during the early 1800s. Nuts coated with sugar and pieces of candied fruit were the first German Christmas tree ornaments. Ornaments cut from gingerbread dough and marzipan also became popular, but these expensive treats were out of reach for all but the wealthy. By the mid 1800s, the glassblowers of Lauscha began to produce hand-blown glass ornaments to mimic the fruits and nuts the wealthy were hanging on their trees. Long known for the quality of their glassware (medicine bottles, barometers, marbles and eye glasses), the glassblowers expanded the ornament business into a cottage industry with the men doing the actual blowing of the ornaments, the women doing the silvering of the insides (early in the industry with either lead or mercury, then later on with a mixture of sugar-water and silver nitrate) and the children painting the outside. Thus began the tradition of the beautiful glass ornaments that Germany became famous for. Lovely glass spheres weren’t the only German Christmas tree ornaments being produced. Dresden began producing gaily painted, embossed paper ornaments, and decorations of pressed tin with brightly lithographed pictures were being produced in other parts of Germany. Thin strips of metal called “angel hair” also began to show up on trees around the country. This “angel hair” is what we now call “icicles.” Ornaments were also made out of wood, walnut shells, pewter and wax. Queen Victoria’s Prince Albert (a native of Germany) introduced the glass ornaments to England, and by the 1870s German Christmas ornaments were being exported to Great Britain. Ten years later, F.W. Woolworth (the American dimestore giant) discovered the lovely glass ornaments during a trip to Europe and began importing them to the United States. Though the popularity of the ornaments declined during both WWI and WWII, Germany still imports ornaments to the United States every year. 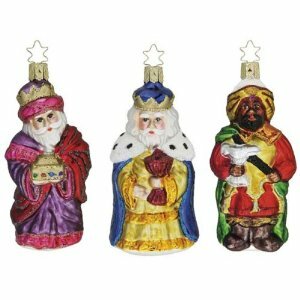 German Christmas ornaments, especially the older ones, are valued by collectors. The most popular German Christmas ornament shapes are Santa (or St. Nick) and Mrs. Claus, Mary and Joseph, rocking horses, soldiers, pinecones and, of course, the German Christmas Pickle. Of the many contributions German culture has made to modern society, perhaps one of the most beautiful and enduring is that of German Christmas tree decorations.